Squash ball "did not contravene spirit of cricket"
Yes, you read correctly. Today the MCC published its response to the allegations made by Sri Lanka, the losing team in the 2007 cricket World Cup final, against the match-winning Australian wicket keeper/batsman Adam Gilchrist. 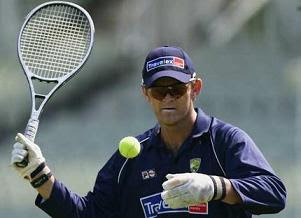 Gilchrist had revealed in a post-match interview that his superb innings of 149 was aided by a squash ball concealed inside one of his batting gloves. The ball was stuffed into the palm of his hand in order to help soften his grip on the bat. The Sri Lankan team subsequently complained that the appendage was not in the spirit of the game. However the governing body of cricket, the MCC, today ruled that it was all a bit of storm in a teacup, and that the Australian vice-captain had done nothing wrong.